There's something going on at Lexus. Like a reservoir slowly fills up, excitement and enthusiasm at Toyota's luxury arm had grown until the floodgates burst last year, culminating with the sublime LC 500 sports coupe. Arguably one of the best grand tourers on the market, Lexus is trying to filter the LC's excellence into other models. 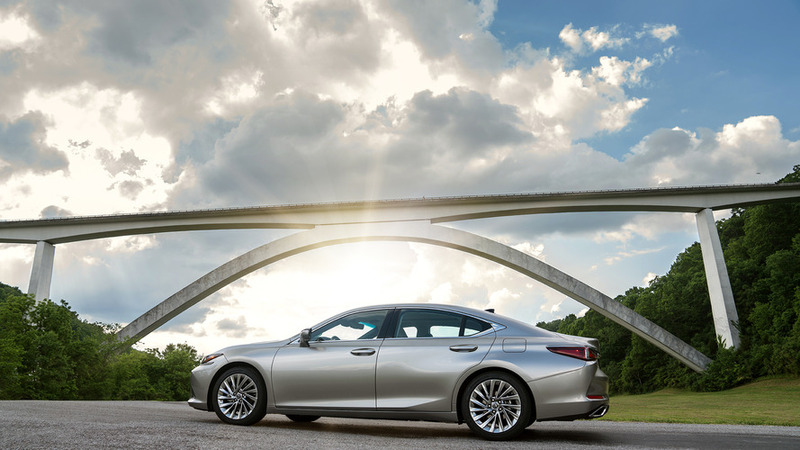 The LS flagship sedan pulled it off, but now Lexus wants to apply the LC formula to the ES. Will it work? 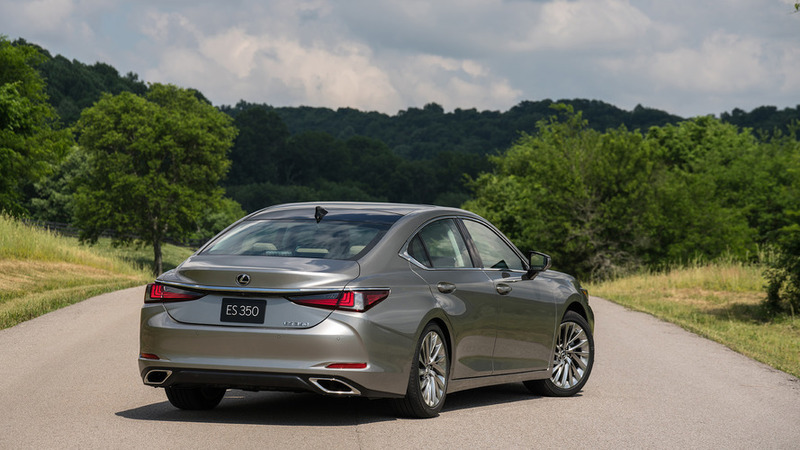 The 2019 ES adopts styling from the LS sedan, improves its interior quality immensely, and gets just a small dose of the LC flag ship's driving charm. 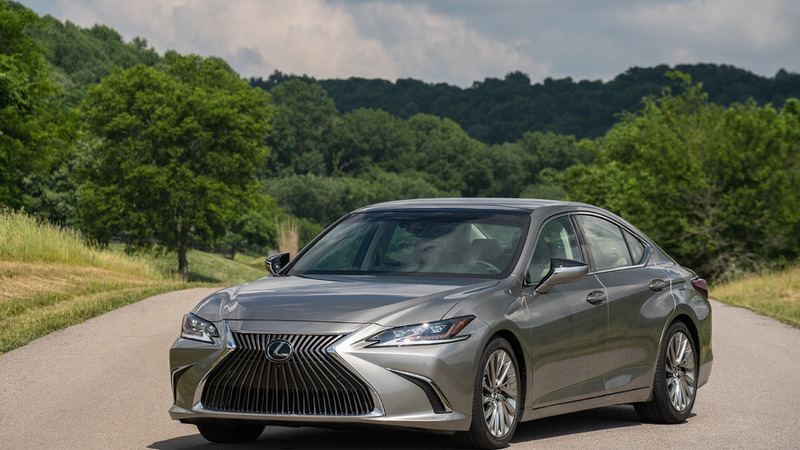 But while it's different from its predecessor in a number of ways, driving the ES around the hilly countryside outside Nashville, Tennessee proves that no matter what Lexus wants us to believe about its newest sedan, this is still a relaxed, refined luxury cruiser. Treat the ES as such, and it's an able companion. Push it hard, though, and the LC-derived charms quickly run out. And that's a shame, because at the very least this is an attractive, sporty-looking car. 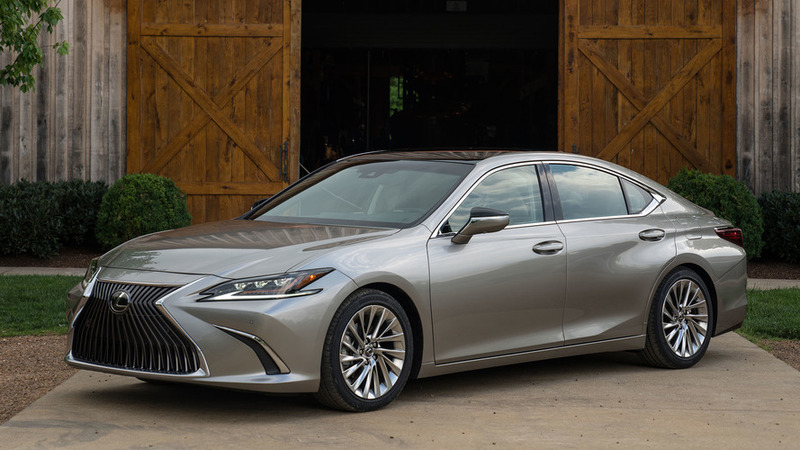 Based on Lexus' GA-K platform – itself a comfort/performance-focused relative of the Toyota New Global Architecture that underpins the Toyota Camry and Avalon – the 2019 ES is a scaled-down version of the Lexus LS and its smoother take on Lexus' polarizing style. Overall, the new ES has a lower hood to accentuate its sporty look, while there are two extra inches between the axles and the whole car grows 2.6 inches in total. It's a striking departure from the last-generation ES, with that sedan's tacked-on spindle grille and anonymous lines. 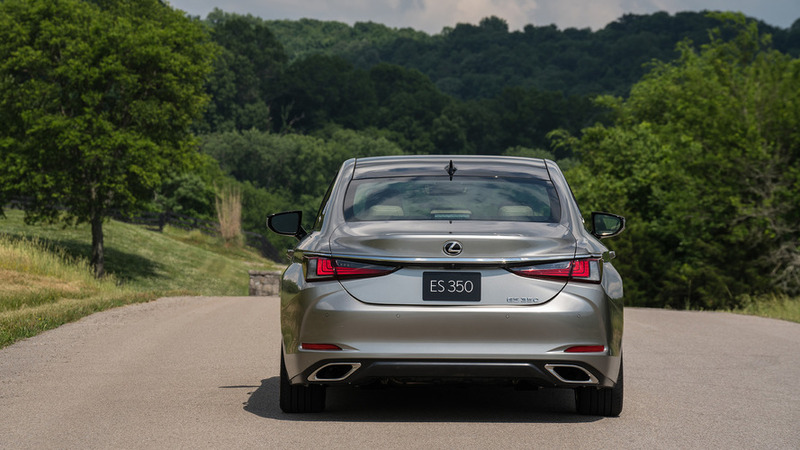 The headlights on the 2019 model look like direct ports from the LS, and out back, slimmer taillights highlight a tighter rear. Like the Avalon, the ES adopts a much more aggressive profile that does its best to hide a three-box shape without compromising second-row headroom. All this reskinning has a practical effect, giving the new ES a coefficient of drag of 0.29 – grab the F-Sport, and that number falls to just 0.26, which is as slippery as a Toyota Prius, a vehicle that depends on swimming through the air to help its high-speed efficiency. But not only does the shape help the ES use less fuel, it cuts down on wind noise, contributing to a very quiet cabin. And boy, is it quiet. Wind noise is rarely an issue, while some innovative touches mute road and suspension noise. The ES' wheels, for example, have resonating pockets in the spokes that cut down on impact noises, while almost all of the new floor gets sound-deadening materials (up from about two-thirds). And even the sounds we want to hear are better, thanks to four innovative engine mounts and active noise cancellation that refines the tones of the standard 3.5-liter V6. And boy, is it quiet. 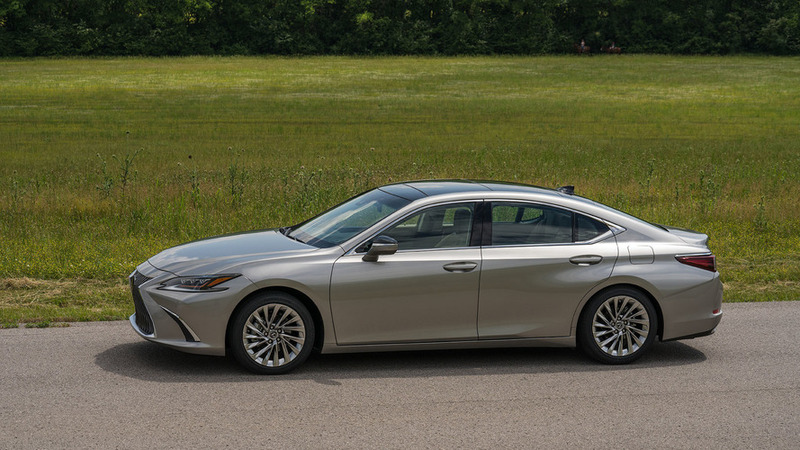 If the Lexus LS' new cabin is too busy and the old ES' is painfully boring, the 2019 ES is the perfect balance. The shapes in here are attractive and smartly laid out – everything is precisely where it should be, so getting familiar with the equipment is a brief process. There's a big center display – an 8.0-inch screen is standard while the 12.3-incher is optional – at the top of the center stack, a slim bank of physical buttons for the climate controls, and on the center console, a traditional gear lever. The hated trackpad for the infotainment system, however, which is as bad as ever, remains. In other words, it's just like the old ES. What's different are the materials Lexus used. This is a genuinely pretty cabin, quite possibly the best in a vehicle under $50,000. 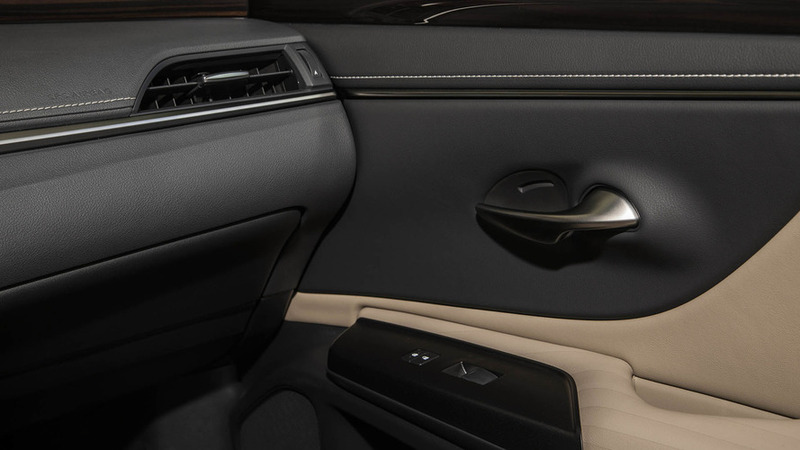 What plastic is here is soft and pleasant to the touch – designers keep it to a minimum on the dash and doors. Instead, there's lots of leather, with the requisite contrast stitching. Said stitching also shows up on the leather seats, and while it's not as detailed, intricate, or excessive as on the LS – which makes sense, considering the price differential – we appreciate the effort. Influences from the LS and LC are constant. Beautiful sabers of aluminum sprout from each door like the world's most attractive and pleasant weeds, just like in the LC. The sensation of using them as door pulls is similar, too. They’re solid and mechanical, and supple, but deeply, deeply satisfying both to look at and use. 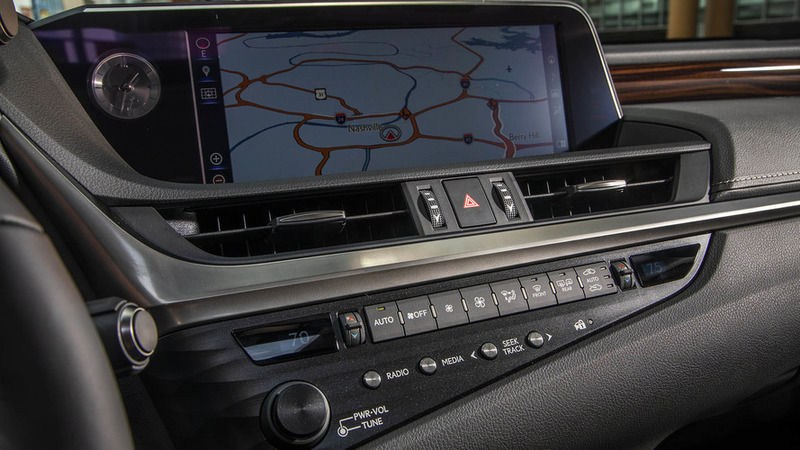 Combine that with the 7.0-inch TFT display in the instrument cluster, and the twin drive mode knobs that sprout from the instrument cowl – our co-driver called them “goat horns” – and it's easy to see the resemblance to Lexus' flagship coupe. And from the LS camp, the speaker grilles on the optional Mark Levinson audio system are delightful. While they're plastic, the grilles look like some kind of volcanic rock, with a seemingly random assortment of holes. It's very neat. Influences from the LS and LC are constant. Designers have been conservative with the wood trim wrapping around the top of the dash. It's also present on the steering wheel, which the ES shares with the LS. Like Lexus' flagship sedan, the wood trim is only on the inside of the spokes, while leather covers the outside. So owners get the style of wood, the tactile benefit and pleasure of leather, and if they select it, a heating function that wraps completely around the rim. The cabin is pretty, but it's also a very nice place to sit. Lexus designers went to great lengths to reduce driver fatigue, adjusting the seating and steering wheel position to keep the driver's back straighter and their eyes facing forward (an available 10.2-inch head-up display helps). 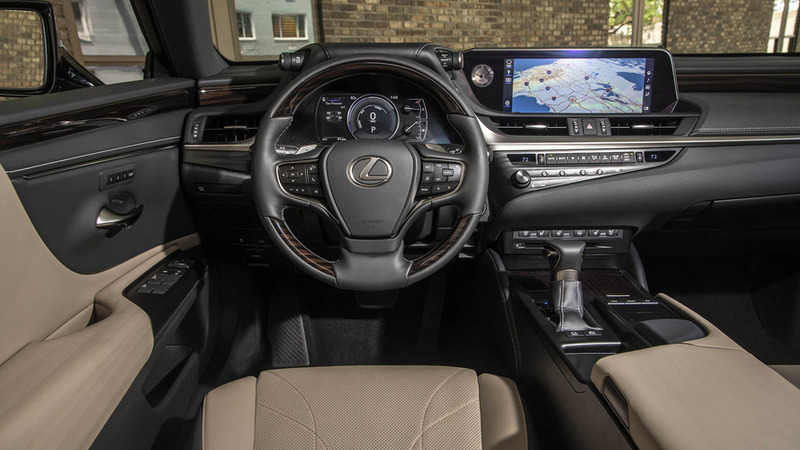 And it works – your six-foot, two-inch author spent most of a late May day sunk into these standard 10-way chairs and emerged with Lexus' innovative Concierge climate system and ventilated seats keeping the cabin feeling like a blast chiller. We ended the day relaxed and refreshed despite the deeply uncomfortable humidity and temperature. The upholstery – leather on our testers, although leatherette is standard – is lovely and there's an ample amount of padding in the standard ES 350. The F-Sport trim adds more bolstering, but it never feels necessary. The range of adjustability is perfect, with plenty of pitch at the front of the bottom cushion and a thigh extension for drivers who need extra leg support. For passengers in back, there are 39.2 inches of legroom, which is plenty for most adults. Headroom is a little tighter for the taller crowd, at 37.8 inches, but it's certainly easy to deal with. The Lexus ES is a very good luxury sedan. It looks nice and is undeniably comfortable. But no matter what Lexus says, this is not a sports sedan. That said, the ES does have some things going for it. The Lexus ES is a very good luxury sedan. One of those is the new ES 350 F-Sport. Like other members of the F-Sport line, this car boasts amped up visuals both inside and out – the red leather upholstery exclusive to the F-Sport is, um, exciting? – including 19-inch wheels, a more menacing grille, a unique instrument cluster display inspired by the LFA (remember that screamer? ), and additional bolstering for the front two seats. It’s suspension also adopts performance-focused dampers. You won't find us complaining about the powertrain, either. The new 3.5-liter V6 packs an ample 302 horsepower and 267 pound-feet of torque (up 34 hp and 19 lb-ft over last year's car). With direct and port injection, that slippery body, and an 8-speed automatic at its side, the 3.5-liter returns a manufacturer-estimated 22 miles per gallon city, 33 highway, and 26 combined. That's a point above last year's car in the city and two points on both the highway and combined scales. And underpinning all of this? A more rigid chassis, a front strut-tower brace, MacPherson struts in front, and a multi-link independent rear. Lexus engineers improved the steering too, moving the electric power-assisted steering motor down onto the rack rather than the column. But like a Fox ensemble comedy that fails to land a joke, the disparate parts never come together to make us care about what's happening. The relaxed suspension tuning makes for a comfortable ride, but not an enthusiastic one. Treat the ES as a sports sedan and there's too much roll, squat, and dive to really have fun, even compared to Lexus' similarly sized GS. And the steering, despite Lexus' attempts to instill more feedback, is still too numb. The wheel is light, which is fine for a luxury sedan but less so for a sports sedan. And that new powertrain? While the power is easy to access and the sound from under the hood and out the back is nice, the throttle response is sluggish, and the transmission's behavior is leisurely unless you switch into Sport mode. And we're sorry, but the average ES driver's idea of Sport mode is playing chip and putt rather than a full 18 holes. Lexus needs to embrace the fact that while the ES has plenty of LC touches, it's a luxury car. It's comfortable and quiet. The suspension doesn't feel sharp enough on a twisting road, but in everyday driving, it absorbs bumps and imperfections, ironing out the worst of them with little complaint – it's isolating, just like a luxury car should be. And those impacts are hardly heard, too. At speed, the ES feels planted, making it a brilliant long-distance cruiser. The power delivery is predictable and easy to manage. And dig past the relaxed throttle response and there's plenty of power available. This is a very, very easy car to drive. 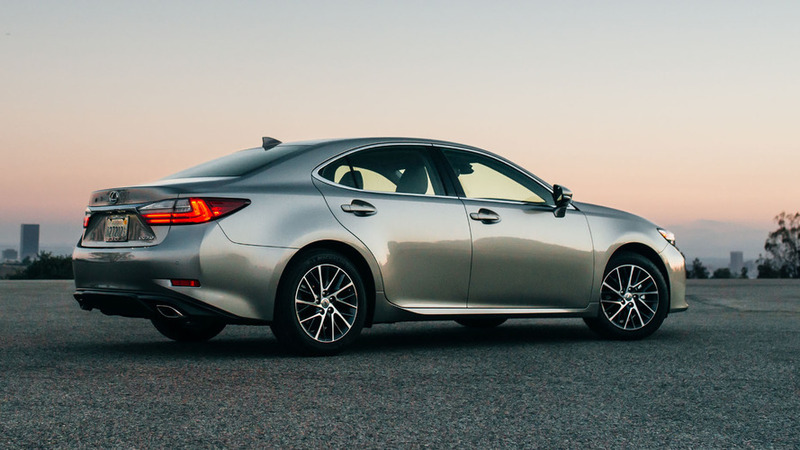 We can't help but feel that Lexus' decision to amp up the ES is a misguided one. It's the company's best-selling sedan – whatever that's worth in the heyday of the crossover SUV – and while we love the idea of automakers building sportier cars, not every vehicle needs that mission statement.